SPAIN’S national Met Office, AEMET, has put 33 provinces on red, orange or yellow severe weather alerts today and 19 of those are for snow. There are also alerts for freezing temperatures, strong winds and high coastal waters too. 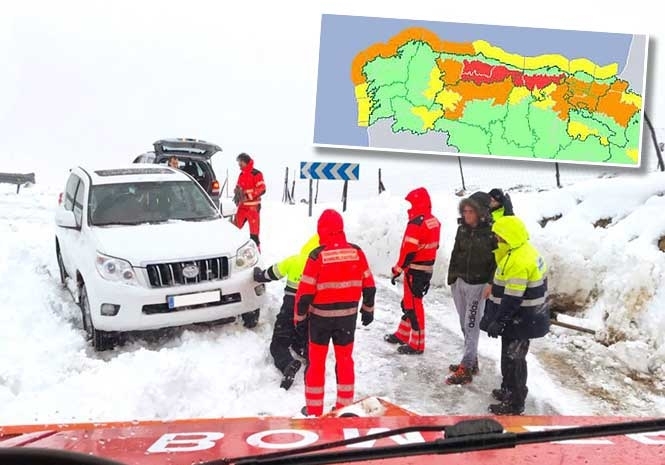 In the north of the country, the provinces of the Asturias and Cantabria are on red alert where between 20 -50cm of snow could fall while Castilla y Leon, the Basque Country and Navarra are on orange alerts. Burgos and Leon will be on orange alert for snow accumulations that could exceed 25cm. In Alava, Guipuzcoa, Vizcaya and Navarra there could be snowfall of around 10 cm. The provinces of Lugo, Orense, Palencia, La Rioja, Huesca, Lleida, Alicante, Murcia, Albacete, Granada and Jaen will be on yellow alert for accumulations of between 3 and 5 centimetres. Drivers are being advised not to head out onto the roads unless their vehicles are equipped with snow chains or winter tyres. In the rest of the northern third of the country, especially the Cantabrian coast and Galicia, the Barcelona coast, Gerona and the southeast of the peninsula will see heavy rainfall. In the Canary Islands and the Balearic Islands the rain could be accompanied by storms. La Coruña, Lugo, Asturias, Gerona and Menorca, meanwhile, will be on orange alert for maritime storms, while Pontevedra, Cantabria, Vizcaya, Guipúzcoa, Gerona, Tarragona, Ibiza, Mallorca, Formentera, Castellón, Alicante, Almería, Granada and Melilla will be on yellow alert for the same phenomenon. The strong winds will principally affect the provinces of Huesca, Zaragoza, Teruel, Gerona, Lleida, Tarragona, Castellón, Ibiza, Formentera, Melilla, El Hierro, La Gomera, Gran Canaria, La Palma and Tenerife, all with activated yellow alerts. Huesca, Albacete, Ciudad Real, Guadalajara, Gerona and Lerida will also be on yellow alert for minimum temperatures that could fall to -4ºC. AEMET forecasts 90% of the peninsula could be affected by several days of freezing and cold temperatures on Monday.